We use 100% polyester fabrics on the MoonLight tents. They cost more than similar nylon fabrics so we better have a DARNED GOOD reason to use them. We do: it makes the tent almost completely sag proof. When nylon gets wet, it absorbs water and expands 3.5% in length (2% for nylon 6,6 - "high tenacity nylon"). Polyester is unchanged for all practical purposes*. Three and a half percent doesn't sound like much, but if you do the math it's dramatic. 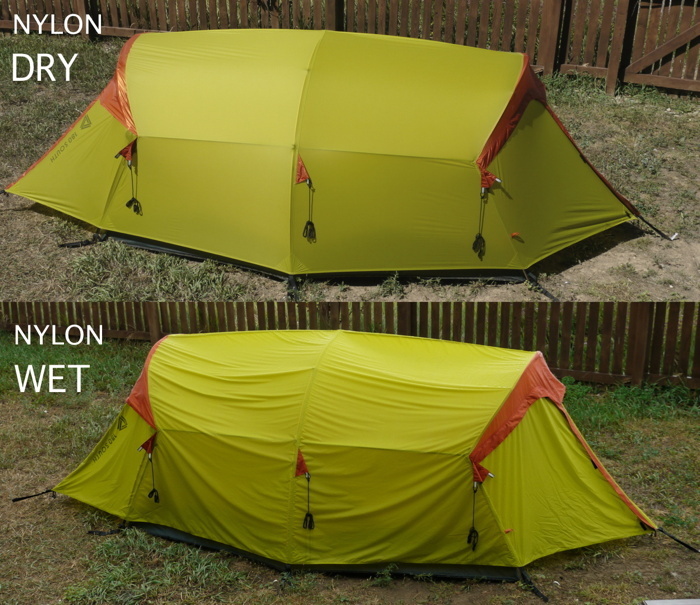 Small tents have at least one fabric dimension over 120" long that will shrink and expand 4” from full dry to full wet. Little dome tents measure more like 140" over their tops, so that's 5” of expansion when wet. Big tents, well, the numbers get so large that all big tents have been forced into polyester for quality control reasons some years ago. You can't even make a large nylon tent in China that will set up correctly in the Western US. I've been there: approved tents that looked beautiful at the factory came into the warehouse and THE TENTS COULDN'T EVEN BE SET UP without cutting the poles down — nightmare! It took more than a decade for some manufacturers to find the polyester solution but now it's the norm (except in backpacking tents where the effect is less and the user's willingness to ignore it or blame it on themselves can be relied on). Take a look, almost every quality manufacturer of large tents uses polyester for the majority of their tent fabrics. Another really nice thing about polyester is that since it absorbs less water, it dries faster AND, of course, it weighs less when it's wet. Some polyester tents still use nylon for the floors with the explanation that it has higher tear strength. If those manufacturers were actually getting data to evaluate how much tear strength is need in a floor, that would be a fine thing to say. But they don't have that information, not at all. 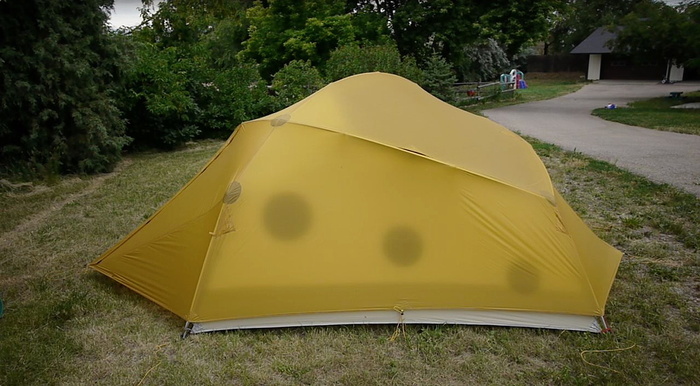 Instead they think to themselves, "What I've been using isn't causing torn tent complaints so I'm going to just stick with what we've been doing." I really think those manufacturers should re-evaluate the situation because it’s those tents that look all tippy-toed and scrunched when they’re set up in a dry area AND their actual square footage is about 7% lower than what they claim — that's kind of alarming! * Polyester absorbs just a few tenths of a percent water and doesn't seem to grow or shrink at all. A Polyester rainfly before and after (8 min hosing) - boring but good. By the way, the polyester fabric on this particular prototype didn't have an exterior silicone treatment. It was just polyurethane on the underside. All our current fabrics are sil/pu with silicone on the outside plus polyurethane on the underside. They repel water really well and they don't let it through. Talk about stoic! Backpackers have put up with this sagging for DECADES. This probably explains a lot to you experienced tent users out there. You knew something like this must be going on. But you dutifully went out to re-tighten everything in the middle of the night so it wouldn't flap and drip. But it wasn't your pitch job coming loose or fabric stretch or the weight of the water on the fly or anything like that – it was just the nylon expanding because it got wet (probably also made worse by nylon guyline cords). Pretty shocking and completely unacceptable for our purposes here: to have the ultimate no fuss, set-it-and-forget-it tent. Now that sagging and stretching nylon is outed, it can be understood as a tradeoff that ultralight backpackers must make (in 2018, still) to have the absolute lightest tents possible. Tent-worthy polyesters currently only go down to 20D fabric weights. Nylon fabrics are available all the way down to 7D. 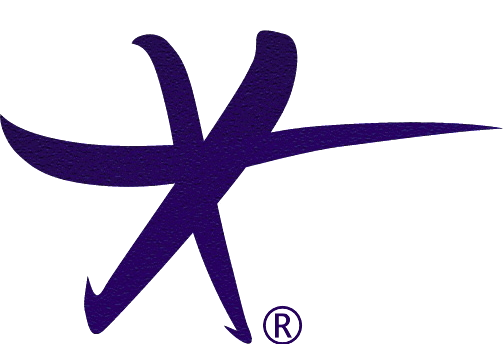 Why don't other brands use and promote lightweight polyester fabrics? There are two kinds of brands, ones that "go with the flow" and do what is normal and expected (usually for a good price) and ones that are pushing the marketplace with their voice to champion certain features and benefits (for which they rightfully get a higher price). Right now the ones pushing are selling the lightest tents possible which are therefore made from 7D, 10D and 15D nylon fabrics. The weights of these nylon fabrics are lower than available lightweight polyesters – currently 20D is the lightest for polyester. So the lightest polyester fabrics are in a no-man’s-land marketing-wise. The feature being talked about by brands that push is the lowest possible weight. Polyester fabrics don’t offer that advantage so they’re out. Plus there’s the problem that if a push-brand decided to sell the advantages of polyester, they would be also be saying that their top-end tents were actually not that great. Meanwhile, go-with-the-flow brands mostly sell tents in the $200 range made out of 68D and 75D polyester fabrics because of the excellent value those fabrics offer. For their marketing and customer, tents made from 20D polyesters are far too difficult and too expensive to sell. You see how this plays out: no 20D polyester for anyone but fanatics (me). There's one more reason why some manufacturer's stay away from polyester: the specter of color transfer. It's kind of a boogeyman thing – no-one points to a specific reason it happens, only that it could, especially if a dark color is put next to a light one. Yet, despite it's monster-under-the-bed status, ALL the big tents in the camping world use polyester and they seem to do just fine. We've taken the approach that sagging when wet is completely unacceptable and we're willing to manage our fabric suppliers to ensure that the colors don't bleed (and we also have chosen colors that would be hard to even know if there was any bleeding of one onto the other). I’m the first to admit that this page might come off a little strident. I mean, how bad could nylon be if people have been using it without complaint for many years? 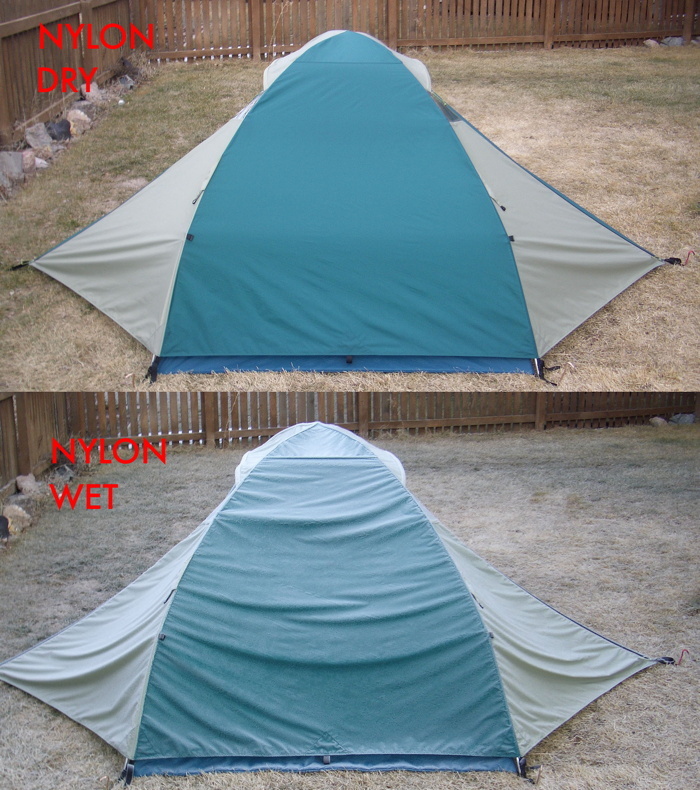 From what I’ve seen the answer, frankly, is “pretty bad.” Take a look below at the photos below which show some dry-to-wet photos of nylon tents. I don’t know about you but I’m not putting up with it any more. 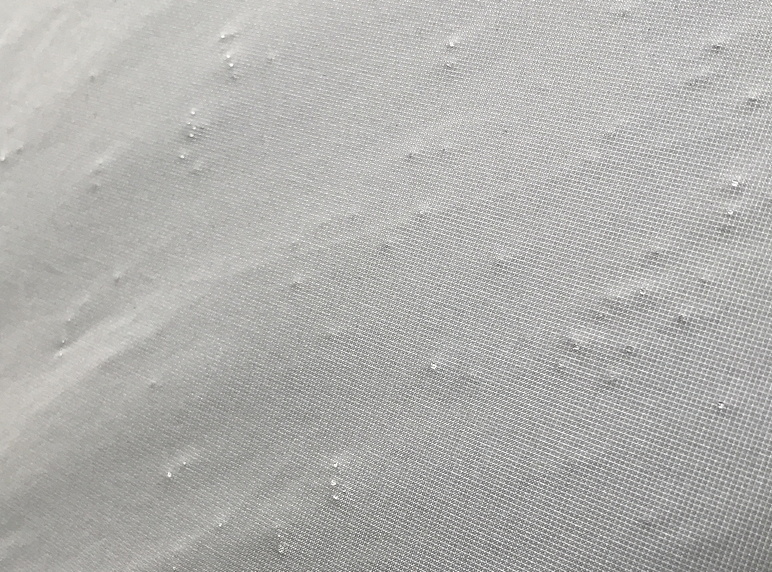 The rain droplets were causing little bumps to form on the nylon fabrics as the wetness expanded the nylon under them. Lovely and kind of striking to be walking around in a sea of tents that were all getting acne - or smallpox - while the company reps who were present completely missed the sight. They didn't even see it. 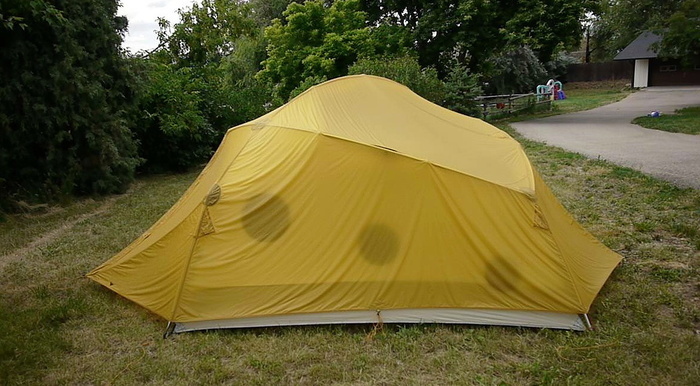 This particular tent rainfly was a super-ultralight made of 10D sil/pu.